Detail of Matthew Picton's "Back Alley Cutout #6, Medford OR" at Mark Woolley. ebruary was uncharacteristically bright and sunny beyond meteorological phenomena. In the galleries, artists that used to be dull seemed to have sharpened their work, while good artists showed occasional signs of becoming brilliant. There were lots of interesting shows with a good mix of national and local offerings. For that reason I can't wait to see a smattering of James Boulton's latest at Pulliam Deffenbaugh and Dianne Kornberg's potential victory lap at Elizabeth Leach this month (I've seen some of her new work, so it isn't blind anticipation). Overall in February, the brilliant Matthew Picton at Mark Woolley had the most accomplished and thought-provoking work, but the Amanda Wojick and Claire Cowie combo at Elizabeth Leach Gallery were also main attractions. Add in Dave McKenzie, the CEID show and Mona Superhero  and it was definitely a month with lots of worthy things to see. Superhero (a local) has done well in New York but I find her smartly executed duct-tape work lacks the depth to go beyond novelty. On First Thursday I ran into lots of other things to like as well. Local abstractionist G. Lewis Clevenger finally took a page from Hans Hofmann's playbook and juxtaposed receding cool colors against advancing warm tones. 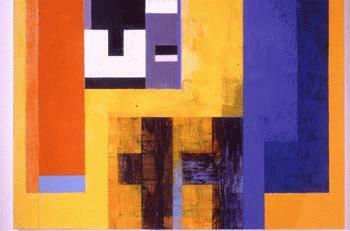 This enlivened his rather formulaic geometric compositions to great effect. Now they'll stand up to higher standards, as evidenced by his recent Joan Mitchell award. Conveniently, Portland collectors noticed and all but one painting sold. Note that most of these works were Hofmann-sized  do you think the Pearl District loft real-estate boom is having an effect? Hmmm? At the Everett Station Lofts' tiny Epitome Gallery I found Scott Wayne Indiana's installation of two-by-fours to be memorable. The work's enveloping pine scent, combined with being surrounded by a processed forest, was really enjoyable. I'd like to see where this goes. Matthew Picton's "Cut Out Drawing, Brisco School Playground, Nov 1999." It's no wonder Matthew Picton is receiving ever more national attention and is featured alongside the likes of Jack Pierson, Christian Marclay, Polly Apfelbaum, Joseph Kosuth, Christo, Al Sousa, Nam June Paik, etc., at the very respected Carl Solway Gallery in Cincinnati till April. The show is called "30 ways to make a painting" and Picton is unique and developed enough to stand upright in that group. 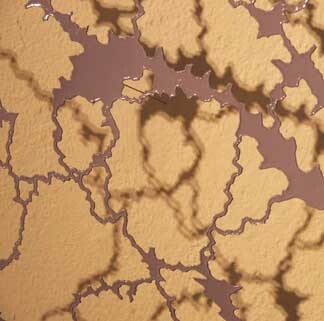 In Portland, Picton's latest work, like the show stopping "Cut Out Drawing, Brisco School Playground, Nov 1999," updates and further clarifies Smithson's idea that earthworks weren't about nature so much as the specifics of entropy and disassociation of space from location. By translating and repositioning the destructive effects of nature into something more durable, what Picton achieves is akin to Shelley's "Ozymandias" poem. The work is a Duchampian readymade remake, an existential love poem to impermanence and vanity, as well as a reminder to savor life. Let's call Picton's work a more durable destruction that leaves an indelible mark of mortality on the eyes. A portion of Matthew Picton's show. That said, I saw some minor presentation problems. The lovely aqua floor piece, "Cast Roadway, 2nd St. Ashland, OR" could have used a small riser to contrast the rich reddish-orange wooden floor. Also, the other colored squares (rubber road castings) should lose the Lucite bars from which they hang. One last thing: The show's largest work, "Brisco School Playground," should have been in the main room instead of getting relegated to the back. Overall, I found the combination of works on paper, stark but fragile looking wall installations and chunkier wall objects a refreshing course in how to transform a single subject of study into variety. One of James's favorite tags. At PICA, the Todd James (aka REAS) exhibit and talk was an informal walk through the unintentionally successful career of a New York graffiti artist gone commercial. He's done it all, from tagging trains and tipping over cars at the Venice Biennale to TV projects. I like how Jeffrey Deitch asked James and Barry McGee to "obliterate" him for a show at Deitch's gallery. That's why he is Jeffrey Deitch and most dealers are so safe by comparison. 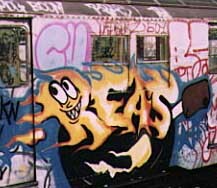 Still, I found James's history lesson on New York subway graffiti a lot more interesting than his exhibition of new graphic work, which is dangerously close to becoming a bunch of adolescent Ziggy cartoons. Raymond Pettibon is better and, as luck would have it, he comes to PICA in April. Still, James's reminiscences of the old train-tagging days were gold. Ten train cars in one session is definitely worthy of underground legend status during that less complicated time. A still from McKenzie's "We Shall Overcome" (2004). Dave McKenzie's Portrait as a Ghost show at Savage Art Resources was definitely worth a romp, too. His video, "We Shall Overcome," was a perfectly timed call to arms back in 2004 when regime change at home was a topic. 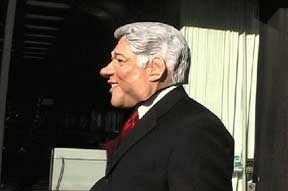 With the artist donning a Bill Clinton mask in Harlem, he projects both the hope and expected disappointment that ex-president's presence creates in that iconic neighborhood. With Louis Armstrong's music (the appropriate "We Shall Overcome"), the video feels good but where is the substance? Most of the emotional power of the piece comes from Satchmo's music  not Clinton's effigy. Beyond the music the imagery is all Clinton: all show, smiles and walking with a purpose. Yet, there isn't any real change about to happen. I think that is part of why the video works. After this last election, the piece feels a little dated but one can't deny it has some residual soul. Other works in the exhibition, like the black Santa Jesus and coffee mugs, just seemed like witty filler. Let's just say Dave McKenzie is not Bette Saar or Chris Ofili. Instead, McKenzie is trying for hollowness in iconography and achieving it all too easily. Kristan Kennedy's latest show, Valentine Field at Elizabeth Leach, was a major step up for the artist in terms of visceral acuity and visual payoff. In the past, her silhouettes of heads reminded me of a certain piece my parents commissioned. It was a double portrait of my little brother and myself  we were wearing clothes the Brady Bunch kids would have considered too '70s. Mercifully, Kennedy gave us none of that nostalgic sentimentality this time. Instead of saccharin nostalgia, this new work is about process. Specifically, the studio process as it leads the artist on a journey through the intentional and unintentional. 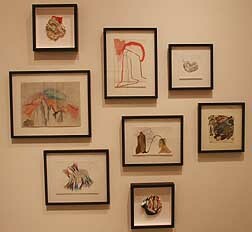 Many works were made by using one work on paper as a pallet for another piece, setting up an interesting 21st-century causality string. Kennedy then goes back and highlights certain aspects that the unintentional process created. A group of Kennedy's works. Andre Breton would have approved and the work is certainly full of eccentricity, because it's basically the intentional work and the studio floor all at once. 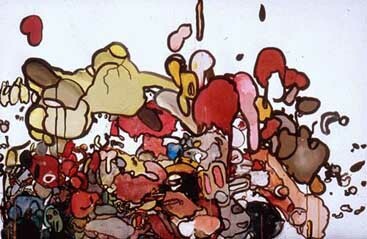 The most fully realized piece was "Blob 1." "Blob 1" has a moldering quality, like a compost pile but more fleshy. Is it a gut pile from some deceased creature (or a painting)? I want to see where this work goes. If there is one criticism, it's that the color schemes of hazel and chestnut brown with red, teal and hot pink is too décor friendly (if you shop at Seaplane, it's couture friendly). If the colors varied between the very intentional autumnal tones found here and some more unintentional color experiments, the work might push more buttons. Curator Rose McCormick's Central Eastside Industrial District group show was an interesting cross section of various styles. The quality of the work varied but there were two gems and some interesting teasers hinting at possible improvements. It's no secret there are a helluva lot of artists in Portland and it's true most of them have either lived in the CEID or staged shows there. It was home of the first Donut Shop, the Portland Independent Salon 2001, Meeting People, Maritime, the Best Coast, some of Core Sample and, most recently, the Affair @ the Jupiter Hotel art fair last year. It is where a lot of the action has been. Also, now that Savage Gallery, the nationally lauded clarklewis restaurant, the Doug Fir, New American Art Union and Holocene have set up shop, it's where you go if you know what you're doing. Note: the artists knew it first  so pay attention. First off, no stylistic arguments were made by this show (although they could be made in future curatorial projects). McCormick did a good job of being eclectic. All of the work was adequate, but four pieces rose above being OK and two were wonderful. Not bad for a semi-rookie curator. The first thing one confronts is Greg Simons's "Untitled #43." 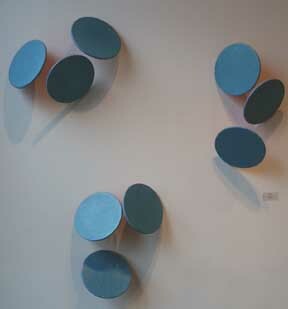 The work is a series of blue disks on a wall. They look like nice mod-minimalist tchotchkes from far away, but up close the surfaces are somewhat crude and the work falls apart. Minimalism is hard and this piece shows why. The details absolutely matter. There is a similar evocation of minimalism's ghost in Brad Adkins's "Architectural Drawing." Made from a clear Gatorade bottle that has been perforated relentlessly, Adkins is finally showing that he understands his own artistic impulse and process. Years ago he would say that making the work is his least favorite part. OK, valid stance. But it definitely showed and undermined his efforts. His old joke-based work was akin to a prop comic's act and embarrassingly lacked the intellectual rigor of Carrot Top. The work needed (but was too forced to have) the absurd reflexive knowingness of Martin Creed or Charles Ray. Now, after drilling so many holes in the bottle, it is clear that Adkins has become a process artist and accepts it. The truth was that we all saw his joke-art as a cover-up for deficiencies in education and experience. It was obvious he'd never met with a real critique and he's been treated with kid gloves. Besides, it's no secret that the Oregonian will rubber stamp anything that invokes the idea of "community," no matter how ill conceived. This new work is much better and I'm thrilled that progress, rather than excuses, is being made. Still, "Architectural Drawing" isn't great. It's an over-indebted riff on Tara Donovan and Tom Friedman's jaw-dropping process work, but it sets up a motif of nonchalance and porous insinuation into space he should mine. It's also an object that objects to the object's traditional use. 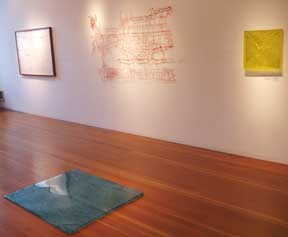 Adkins's best piece shown to date was seen in January at the PDX group show. A roll of blue painter's tape coiled inward, it, too, rejects any traditional use or functionality. It also serves as a personality surrogate for the artist who recoils into himself like a turtle when startled. Charles Ray previously mined this motif very well, but was only successful by interjecting himself into the work. Still, I like how the piece was like a passive-aggressive Richard Tuttle making an anti-painting statement while perhaps longing for painterly release. It lacked Tuttle's adventurous tidiness, but Adkins is developing a vocabulary of useless and futile gestures. It's good to see. Let's hope a little more original vocabulary in material and process tempered by self-knowledge creeps in for his solo show at the Art Gym's project room later this year. At all costs avoid the overt prop-comic jokes. It's just a defense mechanism and it fools no one  "Defense Mechanism" might even be an OK show title. The forthcoming show will determine if Adkins is just a conflicted wannabe mediocre academic conceptualist who craves but doesn't learn from attention, or somebody who just took a while to develop. I'd say it's a 50/50 bet. The best work in the CEID is "White Light" by Matt Cardinal. 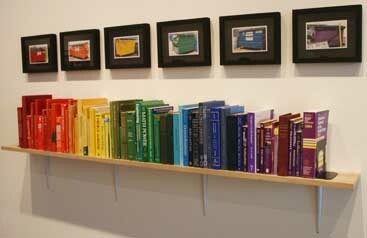 The work is a rainbow shelf of books arranged along the visible light spectrum with a rainbow of dumpsters displayed in corresponding colors above it. The titles of the books have no theme and act as totems of variety. The title, "White Light," refers to how all colors of the spectrum combine to become white light. Anecdotally, white light has associations with truth. Some interesting questions can be raised by this arrangement: Does the information contained in the spectrum of books become knowledge in the light of day? Or does it all end up at the dump no matter what color dumpster you use? 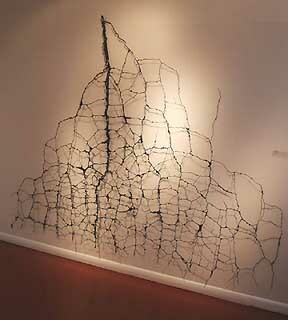 Poetic and up front, this work makes a great impression. Last but not least is Jesse Durost's "Compulsive, Unrestrained, Consumption and Proliferation: The Study of a Black Hole." Just like its title, it's a study in excess. 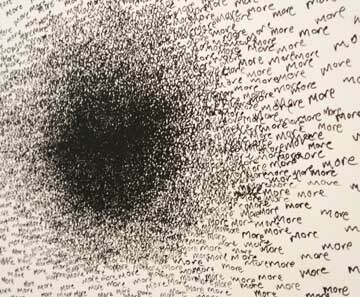 It is a simple piece of found plastic with the word "more" painted relentlessly until the gravitational density of mores become an unintelligible black hole. It reminds me that minimalism is mostly a misnomer as its works are often comprised of studying excess through simplicity. Reminiscent of Christopher Wool and Ed Ruscha among others, this was a smart piece executed perfectly. As a final validation for a job well done, the collector that I brought with me to the show bought it. I'd like to see more from Durost in the future.